Autumn in Korea is filled with great sceneries. Mountains are covered with red and yellow autumn leaves and fields are covered with cosmoses in full bloom. And there is yet another plant that makes Korea more beautiful in fall. Recently in Korea, pictures of pink fields are dominating people’s Instagram feeds. 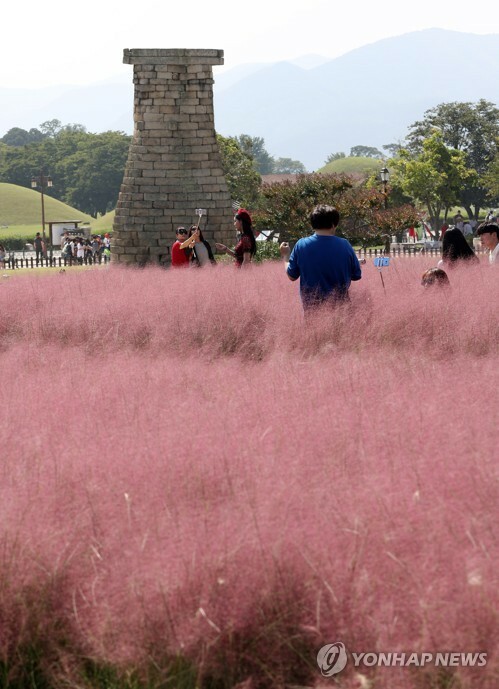 The pink grass, called Pink Muhly, is a type of Chinese Silver Grass. From October through early November, the grass turns pink as its tiny flowers bloom. Because of their exquisite appearance, a lot of people choose Pink Muhly fields for fall picnic destinations. The grasses’ beautiful color makes a perfect background for photo shoots. Unfortunately, the capital city is yet to plant enough pink grasses to form a field. But you can find the beautiful pink fields in other famous tourist cities, such as Busan, Jeju, and Gyeongju. Here is a list of places famous for Pink Muhly Grass fields.